Picture by Prachi Gauriar via Flickr. When I’m not taking photos or drinking beer, the tech junkie inside me likes to find a cool spot downtown and ‘geek out’. 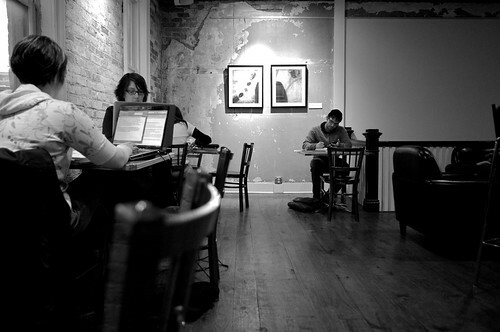 Coffee shops are usually the place to find people doing the same being productive for their work or for a hobby. I’m a big fan of drink and wi-fi on slow weekends and I know there are others out there. Inspired by John’s recent comment on the topic (you the man!) here is a short list of places to visit that offer good atmosphere and amenities for web surfing and working. Café Helios is a great coffee shop in Glenwood South. On top of coffee, they also serve wine, beer, and there is a light food menu to keep you from starving. My favorite part of Helios is when the weather is nice and all the doors open up. The outdoor seating is cozy with a wall of bushes that separates people from the sidewalk. Check out half price wine bottles on Tuesday and $2.50 pints on Wednesday. Open late too. Another coffee spot that gets love for having great hours is The Morning Times. They pretty much have the Fayetteville St. area covered during late night. A few outdoor tables and large windows on the first floor offer some great people-watching spots when you want to drift away from working. The second floor is practically an art gallery with tables for studying or writing. They have all the coffee you need as well as some juices and snacks. Morning Times is very laid back, even with all the energy right next door at The Raleigh Times. Probably for the less serious worker, The Flying Saucer may have the largest beer selection in downtown with about 80 taps and over 200+ beers total. If you are sitting inside, the day time is usually less hectic until the nightlife crowd shows up and getting a table for all your things is easy. When it’s warm, the outdoor benches are the place to be to get a little radiation from the sun and your laptop screen. The recently opened Boylan Bridge Brewpub has the best view from any outdoor seating area in downtown. The huge patio has several benches for your tech fiesta to gather on. If flying solo, the small tables will do just fine. Microbrew beer and solid bar food will keep you happy as you take in the view. The indoor area isn’t bad either. This goes hand in hand with the upcoming free wi-fi initiative that the city is proposing. Not all tech culture has to include beer or coffee. Grab that netbook, sit on a bench, and get online. You don’t have to spend any money and it works from the Capitol building through City Plaza all the way to the performing arts center. People-watching here is at an all time high when the weather is nice. Those benches were put on the sidewalks for this purpose right? Landmark is more of a happy hour spot because they do not open until 4 pm. The beer garden patio in the back is great when you want to be outside in the shade. The atmosphere at Raleigh Times is through the roof here and they have plenty of tables outside. Getting work done can be difficult; the place is way popular. Port City Java is another coffee shop with plenty of room to sit and work. They have lots of windows that show the activity outside. I’d like to see more outdoor tables though. Sosta is a great early morning and lunch spot. They have a comfortable atmosphere that will let you focus on what you need to get done. Nice list. Since you mentioned Fayetteville Street, I believe Crema has wifi in their shop too. And I encourage folks to support them…it’s good to have yummy ice cream in our downtown core! Don’t forget about Tir Na Nog in Moore Square! Great thing about Morning Times is the outlets all along the walls. Very easy to plug in there. Great presentation. I would say that Morning Times provides a great atmosphere on the second floor. I also think that Crema provides Wi-Fi access, too. Cafe 101 is a great place to chill out as well. However, those of us from larger cities will have to adjust to the slower vibe in the coffee shops, it’s akin to being in church to be honest. Agree afbro! I have lived here for 5 years and what people don’t get here is that the buildings, restaurants, etc don’t make a city, the people do. Raleigh’s only identity seems to be tied with being upscale and high priced. 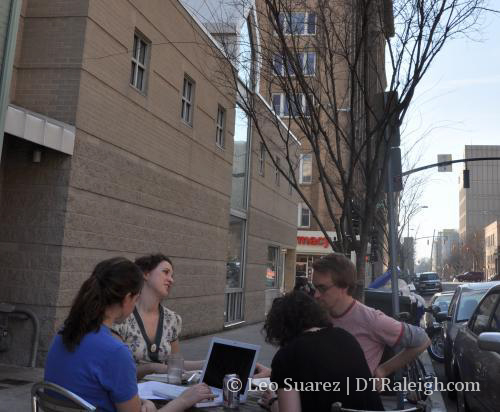 There is no sense of community in raleigh compared to places like Greensboro and Charlotte. The coffee shops here should be packed with blue collar, white collar, etc if Raleigh is as progressive as it claims to be. I really appreciate what you write about here. We try and read your blog every day so keep up the good writing! Lino if you read the blog every day, why are you responding like a year and a half later? Thanks, Lino. I really appreciate the kind words. A little late on commenting, but I’m a downtown Raleigh resident who works from home. I frequent some of the places mentioned two to three times during the week, just to get out of the house and work around real people. My current favorite is the Morning Times. The upstairs room is great for working, the internet connection is usually pretty reliable, the staff are friendly, and the coffe and breakfasts are tasty. I also used to like Helios, but recently it seems to have gone downhill a little. The music often is blaring, you have to crawl under a couch (where the floor is very dirty) to plug in your laptop, and some of the staff act as if taking your order is a bother. However, it always seems full, so maybe it’s just me. As a new downtown resident, I’m just really happy to be able to walk to wherever I work on any given day and I’m always on the lookout for new places to try, so thanks very much for some of the other suggestions in your post.